Although it’s been a while since I last worked on this project, things are continuing to move along. I finally assembled the Ladyada XBee adapters and successfully passed a message between the two XBees. So, I’m not the best solderer and the first adapter I worked on suffered from an overusing tip on my soldering iron, which made heating up the solder with the tip of the iron next to impossible. There were also some issues (that remain unresolved) in terms of configuring the XBees, but thankfully that step seems to be unnecessary (at this point anyways). I spent the better part of the day on Saturday doing some more basic research into connecting an Arduino and LCD for this ongoing project. For the most part, it’s pretty basic and following the wiring diagrams and tutorials online is fine. I ran into a problem with getting text on two lines, which I’ll detail below. Next on the to do list is to order a different LCD, maybe a 4×20 display and maybe something even smaller and then do some work on the text processing part of this whole thing. Overall, it was a good start and I’m anxious for later this week when I’ll have a block of time to continue with the next steps in this early research. The LED Sign is Finished!!! It’s taken a number of weeks, but we finished wiring the LED sign at tonight’s Office Hours! It was a pretty incredible moment to plug in the sign, turn off the lights, and realize that we made this come together. I’m really, really, really happy with how it turned out!!! There are still a few more things we need to do before this project is completely done, and I would like to try it on batteries, but now that we know how bright it is, I think we’ll come up with some more LED projects soon. I went through our LED sign today and removed all the LEDs that had died in our earlier efforts to learn electricity. So now we’re ready to replace these and finish up the sign! 12 out of nearly 200 LEDs isn’t too bad. 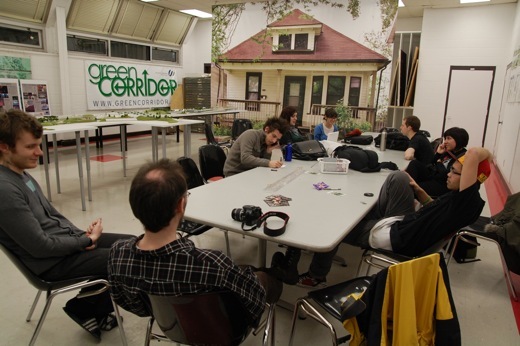 Broken City Lab Office Hours on Tuesday were hugely productive. 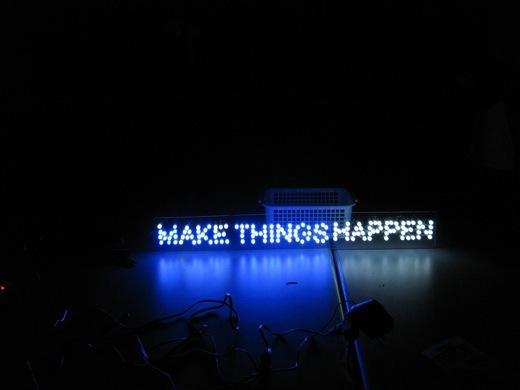 We completely finished getting all the resistors on the LED sign, measured out all the letters with flagging tape for the EC Row Project, organized some logistics for the planning stages of a couple other upcoming projects, and figured out the title for our upcoming show in the Lebel Gallery. Lots of photos after the jump. We’re in week 3 of this LED sign project, and we now know how to finish it up. 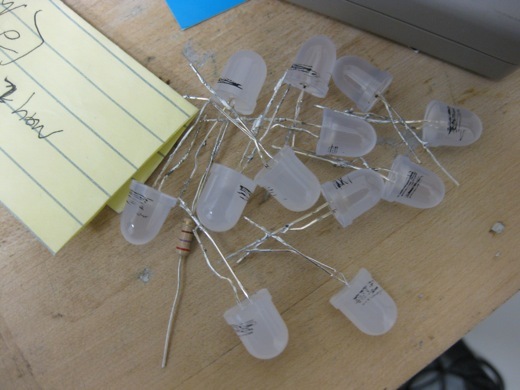 We had previously soldered all the anodes on the LEDs, but we were a bit confused about the connections of the cathodes and resistors. As we had been working off of a MAKE video, which breezed over the connections, we realized we really weren’t entirely sure of how to make those final connections. Michelle and I finished soldering the anodes on the LED sign yesterday morning. Next is soldering all the resistors to the cathodes—this is a hilariously longer process than I think any of us anticipated, but it’s good. I’m really looking forward to seeing it lit up! Also, thank you to whoever passed on the big roll of 4″ red tape!!! Broken City Lab Office Hours last night were hugely productive due, in no small part, to the many amazing people around the table last night. We completed a test with the flagging tape at Lebel (as you can see above) for the EC Row project and continued working on the LED sign. There’s lots of pictures of all the action after the jump. On Monday morning we set out all of the stuff that we figured we would need to start figuring out how to make an LED sign (+ some other things that aren’t really necessary for this project). We cut wires, soldered, used resistors, and mocked up a circuit on a breadboard and it was really, really fun. Lots of photos after the jump. 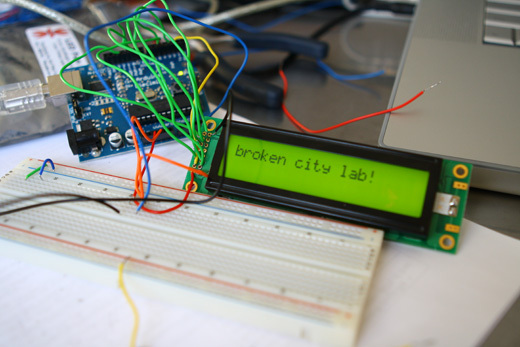 Broken City Lab is an artist-led interdisciplinary creative research collective and non-profit organization working to explore and unfold curiosities around locality, infrastructures, and creative practice leading towards civic change.